The bank robbing Clown Posse of Payday 2 has mown down entire platoons worth of cops, so they probably don't have too many hangups about knocking a Russian Mobster's teeth out of his head. That particular resilience might come in handy for Payday 2's Hotline Miami DLC, out today for $6.99. You might not be into Payday for the gripping narrative, but here's how it all ties in: "Old" Hoxton from the first game is being held by a Russian gangster named The Commissar, and our police-hating clown boys wanna bust him out. And of course, if anybody has a grudge against Russian Mobsters, it's the animal-masked Jacket from Hotline Miami. Check out the live action trailer, complete with a semi-believable Russian accent! The rescue mission has two different phases: the first, "applying pressure" to the Commissar's interests, which probably means hitting white-suited thugs with baseball bats until their heads explode. The second is against the Commissar himself, who alone knows the secret to old Hoxton's location, preferably to synth-heavy music inspired from the 80's. 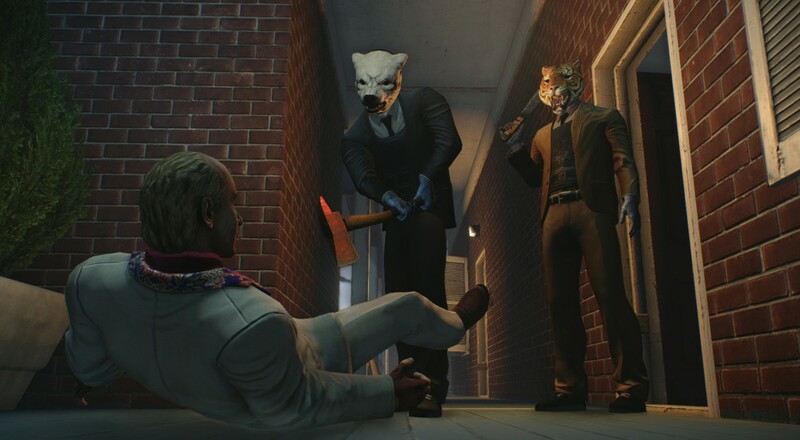 Accompanying the two missions are a slew Hotline Miami-themed gear, from sinister animal masks to brutal, retro weapons. While a few are unlockable in the DLC game, the Briefcase Weapon and several of the new masks are only for those who own Hotline Miami. You can check out their official website for more info.